« Leopard to Bring an Answering Machine to iChat? Every year, in January, the Mac community grinds to a halt to watch Steve Jobs make his keynote address at Macworld. Each year he brings us new products and innovations, some exciting some disappointing. But what will this years event bring? Geeky Mac has taken an in-depth look at all the recent stories and rumors, along with their expert knowledge and experience to outline their 2007 Macworld predictions. Last year Macworld brought us the introduction of the first Intel based Mac (iMac) and the MacBook Pro. But since the entire Apple Computer line is now Intel, what will Apple have in store this year? With updates to all systems, but the Mac Pro and the Xserve it is unlikely that we will see any changes to the Apple lineup at all. 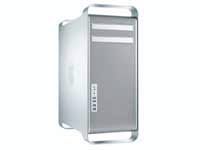 However, it is feasible that the Mac Pro could receive a quad-core processor. Also worth a mention but very unlikely, is the announcement a ultra portable Mac, or a tablet based Mac computer. Apple has reinvented the iPod over and over in just a few years. They have cornered the market, but now they have competition, well kind of. It is finally time to see that full screen, true video iPod. But that will probably be the only update to the iPod line. It is only logical to think that Apple will announce some more movie studios signing up with iTunes. While there many not be any more jumping on the bandwagon yet, there should at least be some more variety. Steve Jobs showed it himself and said the iTV would sell for $299. That mean that it will be coming out. Steve is not Woz, this one is not a practical joke! It is very possible that the iTV may not be ready for prime-time, but we should see a more detailed demo, and get a little more incite into what the box is actually capable of. It is also so surprise that Leopard is on the way. It is unlikely that it will be released at Macworld however. In the past Apple has had special events at it’s Apple stores (something we have not seen in a while) for the release of it’s new OS. What we will get is probably a more detailed demo of features, and possibly an official release date. Apple will be pushing for all software to be available in a universal binary. We will probably see reports form Adobe and Microsoft regarding the progress of their transitions. Will the iPhone come out, will it even be announced? This one is really up in the air. While analysts talk and rumors fly, there has been very little concrete evidence from Apple supporting the development of the iPhone. It sure would be nice if it was announced, but the reality is that it is very unlikely to see the light of day. At least yet.